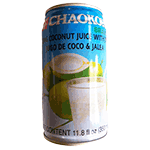 Chaokoh Young Coconut Juice With Jelly (Jugo de Coco & Jalea) in 11.8 fl oz (350 ml) can. Refreshing 100% real coconut juice. Product of Thailand.